Register for your account here! There is a source of incredible self-healing power within you. When you discover the truth of who you are, connect with it and embrace it and learn to love yourself, this truth can empower you to achieve major positive and lasting life changes. 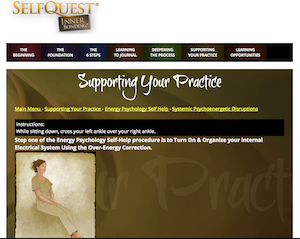 Created by Dr. Margaret Paul and Dr. Erika Chopich, SelfQuest is a journey to find your true nature, your true calling and your true potential. It is a journey of self-discovery, self-healing, self-love, self-empowerment, self-transformation and relationship healing. 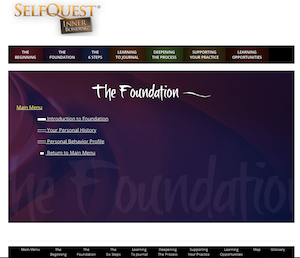 SelfQuest is a self-guided journey that takes place at your own pace, in the privacy of your own space. There will be challenges on this journey, but it is a journey well worth the effort because its invaluable rewards will last a lifetime. 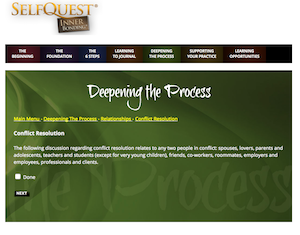 SelfQuest is a comprehensive educational, personal empowerment and conflict resolution completely encrypted online program. A reliable, detailed road-map on your journey to self-healing anxiety, depression, shame, addictions and relationships. Professional wisdom to assist you every step of the way so that you can understand why you are suffering and what to do about it. Effective tools that let you apply what you learn to manage or overcome life challenges, enabling you to stop abandoning yourself and learn to love yourself. 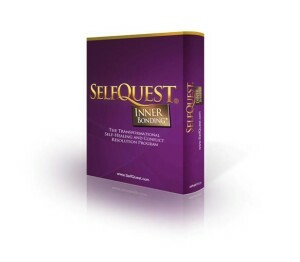 SelfQuest unleashes the true power and consciousness within you to help you realize the life changes you desire and deserve. The power to find yourself, heal yourself and love yourself through the transformational self-healing practice of Inner Bonding. SelfQuest Online is a membership site with three levels of membership and you have a 10-day trial period for a refund, so you have nothing to lose! Three months – $197 + 3 months of support in IBVillage as a Bronze member is included in the membership fee. Six months – $397 + 3 months of support in IBVillage as a Gold member is included in the membership fee + 6 free sessions with an Inner Bonding Facilitator in Training, which will be very helpful in your healing process. Unlimited Access membership – 2 Users – $997 + 6 months of support in IBVillage as a Gold member is included in the membership fee + 6 free sessions with an Inner Bonding Facilitator in Training. You can always upgrade to the next level! For example, if you registered for three months and you want to try it for another three months, you can upgrade for another $100, or you can upgrade to unlimited access membership for another $200. Since SelfQuest is something you can go back to over and over for your whole life, you might want the unlimited access membership and the 6 months of Gold membership in IBVillage support that goes with it. 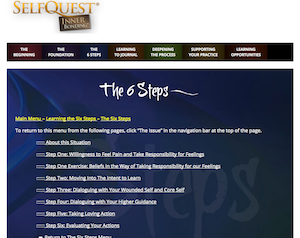 Module 1 guides you in the exploration of your personal history and behavior profile. Module 1 provides The Foundation for the rest of the program. You will become aware of the many false beliefs that are currently limiting you in manifesting your full potential. You will know the root causes of the behaviors that hold you back. 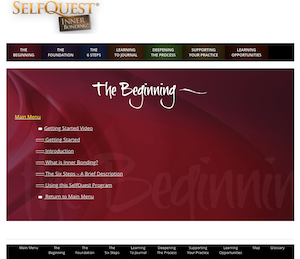 Module 2 is the Heart of SelfQuest, offering you a powerful way of learning and using the profound self-healing Six Steps of Inner Bonding. Module 2 is designed to be used as a guide to applying the Six Steps of Inner Bonding to everyday life. You can go back to Module 2 daily, or whenever you have an issue that needs to be resolved and healed. Then Module 2 guides you through the Six Steps of Inner Bonding relating to your situation in a very in-depth way. Discover the false beliefs that are behind the particular issue or conflict you are dealing with, and what the truth is. Your beliefs and behaviors are stored in a section of this module for later exploration. If you get stuck, Module 2 gives you tools for help in getting unstuck. Examples of other people’s experiences with the Six Step Inner Bonding process will help you further understand the process. Module 2 includes an in depth training in the Emotional Freedom Technique, a tool for releasing overwhelming feelings. Using EFT will help you to clear away the noise and focus directly on finding and making your highest and best choices and actions. Once you become proficient in Inner Bonding, then you can utilize Your Personal Inner Bonding Journal. 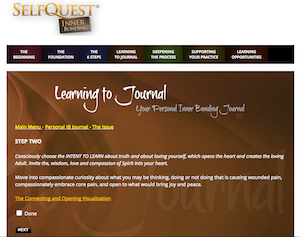 Your journal takes you through the Steps of Inner Bonding much more rapidly than in Module 2. Dreams – created by Nancy Weston, an expert in Dreamwork. All three modules are integrated with each other, so that you can easily go from one to the other. Your satisfaction is guaranteed. Read here for more information. Copyright © 2019 SelfQuest. All Rights Reserved.